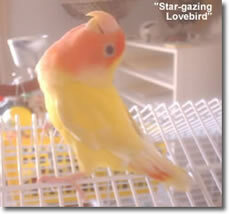 This star-gazing lovebird hatched a "stargazer." This condition was at its worst after hatching and as a juvenile. Over the next couple of years, the condition corrected itself. The photo above shows him markedly improved at about 1 year's old. 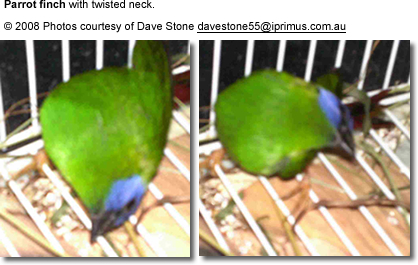 By the time the lovebird was 2 years old, it was hardly noticeable. "Stargazers" constantly throw their head back, sleep with their heads between their legs; go around in a circle; look at the ceiling, turn their heads around in a circle and look up. Stargazing can strike at random and without warning or past history of problems. Finches are particularly susceptible - although other species have been diagnosed with it. ...resolution might be achieved through successfully treatment protocol (antibiotic treatments, etc.). Inability to fly.Loss of balance/equilibrium. Falls off the perch. The end result of stargazing (if untreated or not self-corrected) is almost always death. What Cause Stargazing / Twirling? Viral / bacterial - such as the bird flu. For example, turkeys have shown symptoms of going off their water and their feed, becoming lethargic and/or showing signs of this condition. Farmers report a drop in egg production. The following steps will be an important step in not only preventing this disease, but others too. Provide the best nutrition possible.